Up to 1824 strikes were illegal. It is an interesting coincidence that not only were the quarrymen at Penrhyn, Bethesda, on strike during January, 1825, but that the quarrymen at Dinorwig, Llanberis, also struck to be allowed to finish work at 1.00 p.m. on Saturday rather than at 4.00 p.m. Assheton Smith agreed to this, but Col. Edward Douglas Pennant refused to negotiate anything. Others followed this first strike at Penrhyn, one in 1846, which turned out to be a complete farce, and another one in 1852. Pennant trampled on such actions with an effective policy of victimisation. Indeed, that would be the response at Penrhyn for the rest of the century, a response that culminated in the Great Strike of 1900-03, the longest industrial dispute ever to happen in the countries of Britain. In brief, there was substantial discontent with conditions in many of the larger quarries, with the bargain system becoming a disruptive force. Even though the quarries were isolated, the men could still read about English disputes and trade unionism in such papers as Yr Herald Cymraeg or Baner ac Amserau Cymru. In 1859-60, builders in London went on strike for a nine hour day, and the employers replied with an attempt to force workers to sign a written guarantee that they would not belong to any society that interfered in any way at all with arrangements made between an employer and his workmen. A committee was set up at Penrhyn in 1865 by six men, with W.J. Parry, who was to exert a very considerable influence on the growth of trade unionism from that date until 1893, acting as their interpreter. Concessions were granted and this prompted the men to form a union. They asked Parry to draw up a plan. 1,800 workers joined at once. Quarry owners everywhere were alarmed. Five months later, Pennant, who would be raised to the peerage the following year, stated that he regarded such an action as a device to estrange him from his workers and to foster ill feeling between them. He further cautioned the men, that any attempt to force the issue would lead to an immediate closure of the quarry, which would only be re-opened to men who declared themselves opposed to any such union. Three days before Christmas, 1,229 quarrymen replied that their committee was not made up of agitators, but of delegates elected by themselves, and that they had totally renounced the idea of setting up a trade union. But they had at least increased their monthly salary. Of the six men who had formed the original committee, only Robert Parry was working at the quarry by 1870. The storm of 1874 breaks. By May 1878, Union membership had peaked at 8,368, but in his address to the annual union conference in 1878, W.J. Parry warned against a possible downturn in trade and the resulting fall in wages. He was right. Prolonged depression was setting in. Men at many quarries struck against the reductions when they came but just had to accept the worsening situation. It was a situation that also affected the fortunes of the Union itself. Politically, George Sholto Douglas Pennant lost his parliamentary seat in the General Election of 1880, and in his parting address charged the Caernarfonshire workers with being foremost in falsehood. From the newspaper reports, one gathers that the result was unexpected and the magnitude of the defeat immense. After all, the heir to the Penrhyn had been defeated by more than 1,100 votes. And this, even though G.W.D Assheton Smith had refused to allow any canvassing at all to take part at his Dinorwig Quarry. Interestingly enough, was the fact that quarrymen there who supported the Conservative party were rewarded by a monthly bonus of £1.00, otherwise known as Punt y Gynffon. If both he and his father had stood on one of the turrets of Penrhyn Castle looking towards Bethesda, they could see in front of them a quarry, where the workers spoke a different language to them, and workers who worshipped in Nonconformist Chapels. Additionally, the workers knew more about the quarry and its workings than they ever could hope to, and since 1874, the workmen, in their eyes, were able to come and go as they pleased. Workers, who by even 1864, had supported a local Welsh language press that had sustained the publication over 170 volumes. A deputation was elected to visit G.W.D. Assheton Smith, but his response was to inform his workforce to remove their work tools and barics [barracks] furniture out by the last day of October. (After all, blood is thicker than water!) The lock out lasted until Saint David's Day, 1886. Trade improved in 1890 and 1891, with the profits at Penrhyn rising from £45,000 to £55,000. They were to increase to £89,871 in 1892, and wages were increased by 5% in April 1893. The years 1891-95 also saw a drop in union membership from 5,970 to 1,423. Ironically, it was the 1896 Labour Day, held at Blaenau Ffestiniog that was responsible for lighting the fuse at Penrhyn. Around three weeks before the event, E.A.Young was informed of the men's desire to attend the festival by an elected deputation. He refused to meet them, saying that anybody who wished to attend had to apply for permission individually. Another deputation informed Young that the men were going to Blaenau Ffestiniog in a body. On May 1st, he wrote to his master, Lord Penrhyn, that in his opinion union leaders at Caernarfon had ordered the Penrhyn men to try and pick a quarrel, with the ultimate view of re-establishing the Union and the Quarry Committee as in the days of the Pennant Lloyd Agreement, which of course had been suspended in 1885. On May 4th, when around 1,500 of the workforce were absent, Young closed the quarry in order to throw the loss of wages on the backs of the Agitators. And to rub salt into the wounds, the men who had absented themselves from the quarry on May 4th were all suspended for two days, not for going to the Labour Day Rally but for being absent without leave. E.A. Young was preparing for a pitched battle. July and August saw the drawing of battle lines. On July 2nd, a standard daily wage was asked for and refused. On August 7th, a list of complaints were sent straight to Lord Penrhyn and apparently bypassing Young. A deputation met him ten days later, when all the requests were refused. The Penrhyn-Young axis was as firm as ever, with both singing in perfect unison from the same song sheet. Feelings were running high and Young told W.W. Vivian, his counterpart at Dinorwig, that he would "...stick fast to discipline and retain the management of the Quarry in my hands come what may." Two men were suspended for measuring bargains with a tape measure on September 15th in order to supply the committee with accurate information. After failing to present themselves at the quarry office, where they had been summoned eleven days later, they were dismissed. At a meeting of the General Committee it was resolved that in the light of these dismissals, all negotiations would be terminated and to call a Strike in March, 1896. Two days later, Young suspended 71 men - the members of the committee and the seven who had signed the list of complaints sent to Lord Penrhyn on August 7th. The day following the dismissals, the men refused to take their bargains and start work until they received an explanation of Young's actions. It was September 29th, and the following day they were locked out. This lock out, which Young called a strike was to last until August 1897. During this time E.A. Young became the focus of great resentment. In order to alleviate the poverty of the men, the Daily Telegraph, together with concerts and general subscriptions collected £19,161 for the locked out men. During the lock out, Young always made certain that spies employed by him kept a meticulous record of not only what was said but also who said what. These reports were meticulously scrutinised by him and indexed for further use. Real anxiety, uncertainty and fear of victimisation remained. In June 1899, Robert Davies, who had chaired numerous deputations, to Lord Penrhyn was dismissed. Two months before that, Young ordered that from then on union payments were not to be collected at the quarry. The situation was slowly but surely reaching breaking point. It appears that the spy employed by Young during the Strike of 1896-97 was one Thomas Ellis. Born at Llandyrnog, Denbighshire in 1851, he appears to have travelled around a lot during the first fifty years of his life as the 1901 Census shows. The men had returned to work in August 1897 without gaining much, and holding both W.J. Parry (who stopped working for the Union in 1898) and W.J. Williams partly responsible for their failure. Young's policy for the next few months was to dismiss anybody who happened to be conspicuous in the Union. In June 1899, Robert Davies of Tregarth, the most experienced and respected union leader, was dismissed. The general manager then went on to announce that henceforth, no union dues at all were to be collected at the quarry. The cauldron began to bubble violently, and finally boiled over October 26th, 1900, in violence against a number of contractors. 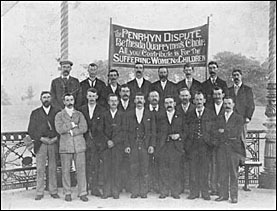 Penrhyn decided to prosecute 26 of his employees, even before they appeared before the magistrates. All the men marched to Bangor to support the 26 at their trial. Everyone was suspended for fourteen days. The first hearing was adjourned, and the workforce all marched to Bangor for the second hearing. Of the 26 accused, only 6 were convicted and fined. The Chief Constable of the County called in military forces and was condemned by various public bodies as well as his own County Council. The men went back to work on November 19th, but 8 galleries were not let out to be worked. Two days later their suspicions had increased even more. On November 22nd, everybody turned up at the quarry but no work was done. Sometime during that fateful morning, E.A. Young telephoned the quarry with a message to the men to go on working or leave the quarry quietly. The men walked out. The uneasy truce of 1897-1900 was over. The Great Strike of 1900-03 had started. Things would never be the same again. But it was in 1922, the year that it amalgamated with the T.G.W.U., that the N.W.Q.U. for the first and only time called all their members out on strike, even though it was only for two weeks. There is no doubt that the 1985-86 conflict at Blaenau Ffestiniog was the largest in recent times. For a start, it was the longest strike at Blaenau Ffestiniog since 1893. Centered on the quarries owned by the Ffestiniog Slate Company - Gloddfa Ganol, Oakeley and Cwt y Bugail, it lasted for seven months. Founded in 1971, the company had worked a Bonus System with success for over a decade. But in 1985, the owners decided to remove this system, as well as continuing to pay women workers on a lower scale than men. The new system meant a weekly reduction on average of £28.50. Seventeen workers opposed the new system and they were dismissed. It is not easy to define the role of women in the earlier strikes, but there is no doubt to the part they played during this dispute. During the Miners' Strike of 1984-85 the women had been instrumental in sending food parcels by the score down to the miners of southern Wales. Now, the miners' wives were reciprocating in kind to the strikers' families at Blaenau Ffestiniog. Incredible support was given to the strike by institutions and individuals and nearly a thousand letters of support were received. Added to this were the weekly Saturday morning street collections undertaken at Bangor, Caernarfon, Aberystwyth and Cardiff. Within thirteen weeks, eight men and one woman returned to work, an act that put an end to a speedy resolution of the dispute. The name 'Bradwr' [traitor] appeared again in the local vocabulary. The women also came out on the picket lines in support. By November, one problem was how to give the 55 children embroiled in the dispute as happy a Christmas as possible. Following an appeal, money, toys and hampers flowed into Blaenau from all over the country, especially so from the mining communities. By mid January 1986, the T. &. G.W.U. was heavily involved, with senior officials appearing on the picket lines. A cassette, 'Safwn gyda'n gilydd' was produced with some of the country's chief performers taking part. 'Safwn gyda'n gilydd' Standing together. What we ask for are our dues for a day's work! For the sake of those who struggled on the rock, the soil and the face. We'll stand together - stand together as one. From the arms of faithful friends comes the strength to carry on. A rally of over 2,000 supporters was held on Saint David's day, 1986 in witheringly cold weather. And then the end came. In mid-March it was decided to end the Strike and accept an ex Gracia payment offered to Oakeley workers. During the same week, another vote was taken, as a result of uncertainty over the wording of the first proposal. The original decision was overturned. It was decided to stand out. But before the end of the week the dispute was concluded.